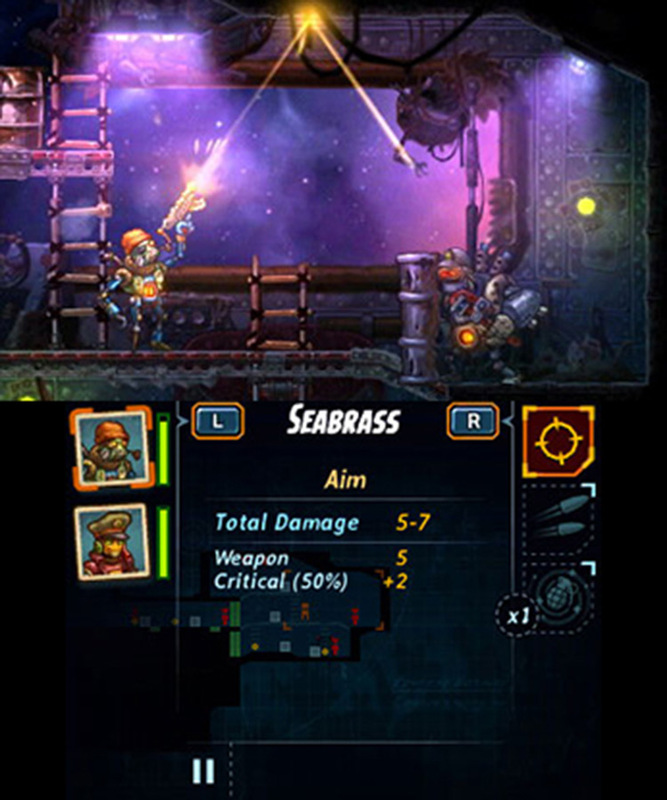 SteamWorld Heist is a space adventure with turn-based tactical shootouts, where you aim in real time and perform awesome bullet-bouncing trick shots. Steamworld Heist stole my heart. The characters are charming, the combat is addictive, and the Firefly-style adventure made every battle a blast. Besides some annoying instances of post-battle maintenance, I rarely felt the need to power down these robots. What more can I say? I loved SteamWorld Heist and I think everyone should play it. Even if you don't normally like tactics games, Heist might be able to change your mind. It might not make a lot of Game of the Year lists, but I can assure you that it is one of 2015's best. 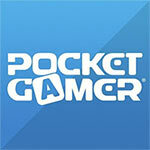 In spite of SteamWorld Heist’s limited inventory system, I recommend making space on your 3DS for this charming title. Its unique 2D strategy never feels as deep as something like XCOM, but I never grew tired of ricocheting a pistol shot off a wall and into the red eyes of a villainous space thug. SteamWorld Heist is both a great entry point for people who normally shy away from strategy games and a good recommendation for veterans. With a deep combat system and a sliding difficulty scale, pretty much everyone can find something they'll like. Taken in parts, Steamworld Heist is an atmospheric journey through the rough edges. Despite the worst of what's out there, it always feels warm. Fans of Firefly will find the tone of it all very familiar, and rightfully so, as the entire sensation of being a plucky crew out in the void is oddly warming. 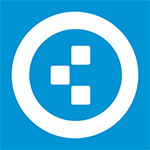 teamWorld Heist is that rare game that is appealing to casual players at the start, who then grow with the game as it expands and deepens its systems. The combat can feel a little repetitive in long play sessions because it essentially is, but overall SteamWorld Heist is an excellent merger of role playing and turn-based combat. Still, the fact that I want to go back and grind some missions to level up my less developed characters speaks to SteamWorld Heist's longevity and satisfying appeal. Image & Form has another retro-inspired gem here, and has further established that like its denizens, SteamWorld stands for piecing together something great from a box of spare parts. SteamWorld Heist is another gem. The universe and its inhabitants are joyful to play with and kept me coming back for more. Image & Form took a bold step by not opting for the easy route, instead choosing to expand on an already interesting theme. Heist is as good as any full priced 3DS game out there; and in most cases, even better. With hours and hours of gameplay, it’s a steal at just $16.99. SteamWorld Heist is an absorbing tactical experience with well-crafted mechanics and systems that in spite of its story and repetitive missions, is worth recommending. As a package, it has a sense of quality in its content that'll keep you engaged well after completing it. Heist is an accessible strategy game with nuanced mechanics and systems that make its ever-shifting challenges a joy to play. By itself, the gameplay is enough to keep the action moving at an excellent pace, and the mission length is perfect for long grinds, or quick sessions on the go. The adjustable difficulty curve and "easy to learn, hard to master" combat makes it a great starting point for those just getting into turn-based strategy titles, and a point of mastery for genre veterans. 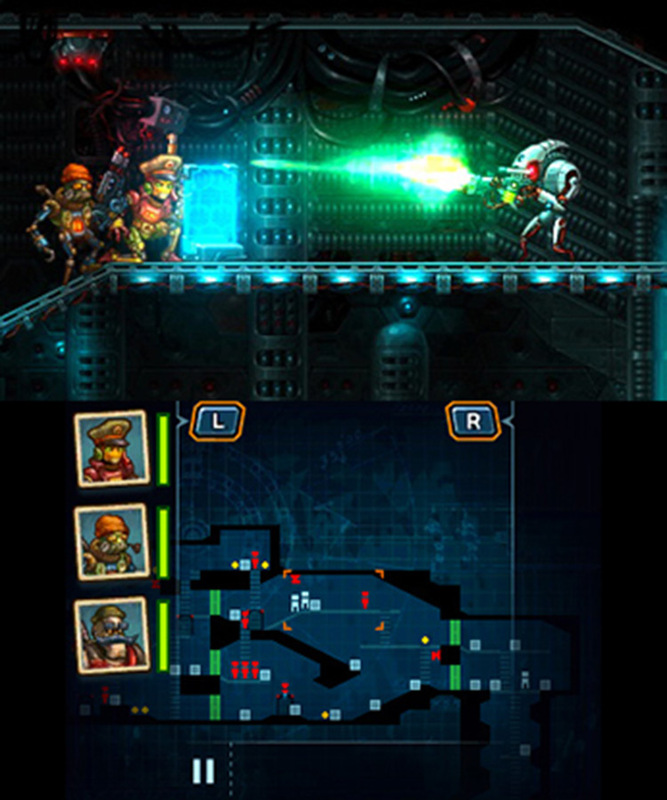 Image & Form really showcases its ability to tackle new styles of play, and succeeds on nearly every level with SteamWorld Heist. While I wasn’t completely sold on the limited inventory space available, the penalties for death, and the initial ease of the game, Steamworld Heist made for a great time. Tactical combat on a 2D plane is hard to make engaging and the occasional urgency of the short levels made for some badass moments where a sharp shot sealed the deal. And somehow, it all feels coherent. 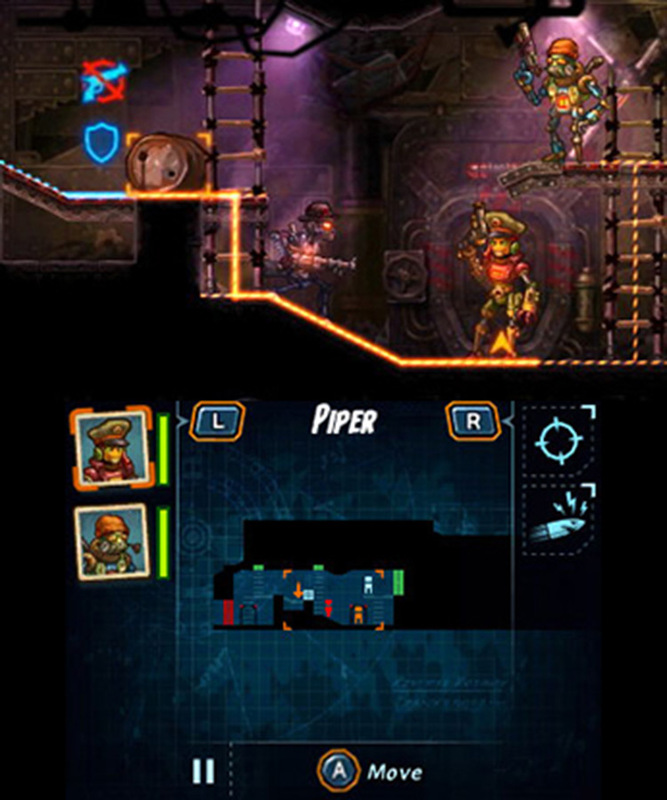 I love SteamWorld Heist, and if you're a fan of handheld strategy I couldn't recommend it more. A unique take on the turn based shooter, and a fun character-driven space adventure. As a 3DS title this game is flying below the radar for now, but upon its larger release, I can see this game picking up a lot of steam. After the jump from Dig to here, who knows where Image & Form will take us next. The tactical and strategic layers of SteamWorld Heist are so captivating that you'll have to excuse us for not getting to the aesthetics until now. But the beautiful artstyle is something really pops on the Nintendo 3DS, perhaps not perfectly suitable for 3D (we turned that off for the most part), but very pretty nonetheless. 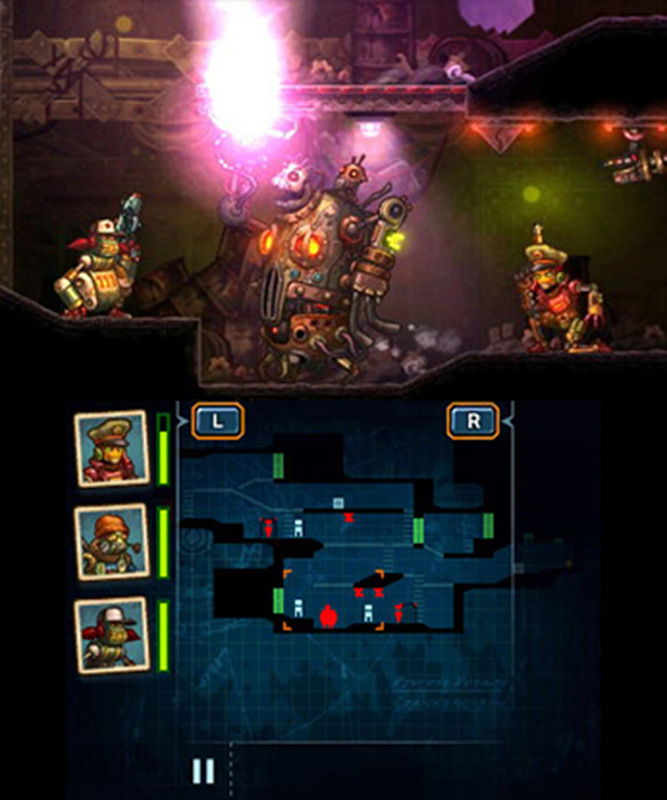 SteamWorld Heist is a wonderfully designed, cheerfully entertaining strategy action game. The sort of experience that will hopefully open up more people to styles of games they’d never normally play, while delighting those that already fans. SteamWorld Heist is another excellent game from the folks at Image & Form. While I wish that the skill trees were less linear, I honestly have nothing else to complain about. 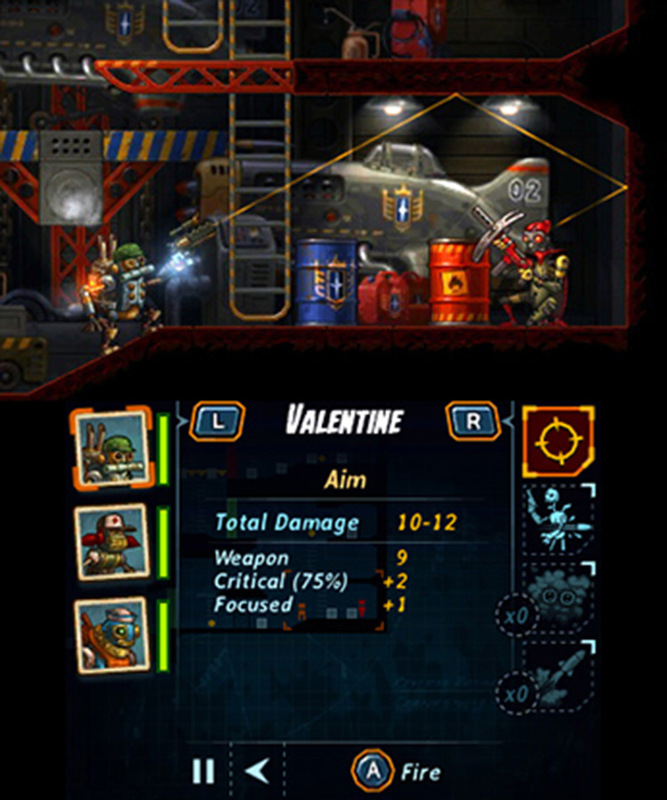 La mezcla de estrategia y habilidad que propone SteamWorld: Heist puede llegar a recordar, salvando las distancias, a otro juego reciente para Nintendo 3DS: de Code Name S.T.E.A.M. 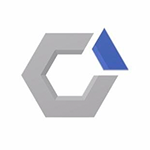 tiene ese punto de frescura que aporta el cambio de perspectiva, aquí unas 2D bastante bien llevadas que traen consigo una navegación por el mapa ágil y una accesibilidad agradecida que sacrifica solo lo justo de complejidad. Su emocionante acción estratégica y fantástica puesta en escena son dignas de admiración y principales culpables de que hayamos caído rendidos a sus encantos; pero también su gran capacidad para sorprenderte con nuevos desafíos de forma constante. Seas o no aficionado a esta clase de videojuegos, no deberías perder la oportunidad de adentrarte en este genial universo robótico. Steamworld Heist es un título de estrategia por turnos pero con elementos de RPG más que interesante, no solo por lo adictivo que resulta, lo rápido y lo difícil (que para unos será un hándicap pero para otros un disfrute). Tampoco es solo cosa de su gran duración o de sus diseños... es por todo a la vez. En definitiva, SteamWorld Heist es un fantástico juego de estrategia por turnos, especialmente recomendable para aquellos amantes del género que echen en falta más oferta en el campo de las consolas, donde los tácticos suelen ser todos de rol. No es el mejor en su terreno, pero ofrece un nuevo punto de vista y resulta francamente divertido, sobre todo por el sistema de apuntado libre y el tremendo arsenal. 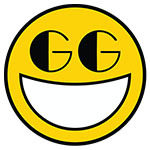 Estamos ante un juego muy divertido, rejugable y recomendable tanto para novatos como para expertos en la estrategia. Su precio es más elevado que el de Dig (19,99€), pero es mucho más ambicioso y largo (la aventura principal dura alrededor de 15 horas), y tiene una oferta de lanzamiento a 16,99€ hasta final de mes. Podemos decir que Steamworld Heist es un paquete de cosas brillantes: gameplay adictivo, excelente presentación, horas de acción estratégica, personajes divertidos y una completa aventura espacial en la que tú decides hacia dónde llevar las riendas. Sin duda es uno de los mejores juegos entre el catálogo digital del Nintendo 3DS tanto para principiantes como para expertos en el género. Steamworld Heist réussit avec brio le passage au jeu tactique au tour par tour. Prise en main intuitive et immédiate, gameplay clair pour tous et difficulté adaptée à tous les profils, le nouveau titre d'Image & Form devrait vous occuper de nombreuses heures, avec une durée de vie largement accrue par la volonté de réussir la partie parfaite et la dimension aléatoire des niveaux qui seront le théatre de vos affrontements. Meilleur à chaque épisode sans renoncer à l'expérimentation de genres très différents, la jeune saga SteamWorld accueille avec ce chapitre Heist un très bon et beau jeu de stratégie au tour par tour, aussi accessible que solide et généreux. Para já apenas a Nintendo 3DS teve o prazer de abraçar e acrescentar este jogo ao catalogo, com as restantes plataformas a receberem um dos mais deliciosos RPG's que há memória já em 2016. Simples, divertido e viciante, SteamWorld Heist faz com que queiramos terminar todo o conteúdo ao nosso dispor, dada a sua jogabilidade fantástica, que motiva a querer progredir neste excecional universo Steam Punk. Nem todos os fãs de Steamworld Digg vão apreciar este jogo mas qualquer pessoa que goste de jogos de estratégia vai considerá-lo como um dos melhores jogos actualmente presentes na eShop da 3DS. Com um orçamento limitado, a Image & Form conseguiu fazer o que a Intelligent Systems não conseguiu fazer em Code Name: S.T.E.A.M. … criar um universo no qual o jogador se quer embrenhar e anseia por terminar o jogo apenas para saber o que vai acontecer. Steamworld Heist cambia registro non solo rispetto al suo predecessore ma anche a tutti gli altri strategici a turni disponibili su Nintendo 3DS, offrendo un gameplay bilanciato e divertente ed un livello di sfida sempre stimolante, favorito anche dalla presenza di numerosi livelli di difficoltà, che rendono l'esperienza adatta ad un pubblico quanto mai vasto. Una certa ripetitività nello sviluppo delle missioni e un level design un po' piatto riduce sensibilmente il valore complessivo del gioco, che comunque può contare su una quantità di pregi, a cominciare dall'ottimo sistema di combattimento, decisamente superiore rispetto ai difetti. SteamWorld Heist è uno strategico a turni dotato di grande carisma e in grado di appassionare per lungo tempo, grazie alla struttura procedurale degli stage e i cinque livelli di difficoltà. Un titolo in grado di dire la propria grazie a una struttura totalmente bidimensionale e un universo Steampunk stilizzato e intrigante. Консоли семейства Nintendo 3DS плохо приспособлены для получения удовольствия от созерцания игрового мира, но в SteamWorld Heist можно просто прийти в бар, встать перед сценой с музыкантами, выкрутить 3D и звук на максимум и насладиться здешней атмосферой. Steamworld Heist är ett ytterst spelbart äventyr som är lätt att plocka upp och spela några uppdrag på lunchrasten, men som är förvånansvärt svårt att lägga ned. Med sin lättsamma humor, färgglada grafik och enkla kontroller och regler avskräcker det inte nybörjare samtidigt som det inte heller är en dans på rosor för strategiveteraner. SteamWorld Dig gick att spela igenom på bara några timmar, medan Heist är mer än dubbelt så stort och tog mig ungefär tolv timmar att spela igenom. Dessutom erbjuder det här en mycket större utmaning och bara det är i mitt tycke värt den ringa prislappen på 179 kronor som det kostar att köpa.